Pets: Dorian (Crested Gecko), Heracles (Crested Gecko), Shoelace (Leopard Gecko), Serenity (Carpet Python), Thistle (Rabbit), and shares Az (cat) with her fiancé. Nelly grew up volunteering at pet stores and wildlife centres since she was 15 years old and has never looked back! 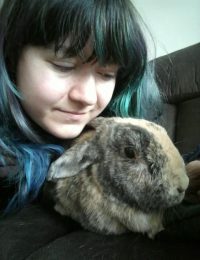 She graduated from Seneca College’s Veterinary program in 2012 and has been working as an RVT with exotics, wildlife, and small domestic animals since her graduation. She’s cat friendly/ savvy and loves any animals she comes across (including the weird ones like reptiles and turtles). She wants to further her interest and care in all pets but has a special interest in cats and exotic pets. Nelly has a lot of hobbies that span from costume making, board games, videogames, art, and leather crafting on her days off.